1. Mode Displays currently operating mode. 2. Operation State From Repeat/Random(Shuffle)/ Scan, displays the currently operating function. 3. File Index Displays the current file number. 4. File Info Displays information about the current file. 5. Play/Pause Changes the play/pause state. 6. Play Time Displays the current play time. 7. Info Displays detailed information for the current file. 8. Random(Shuffle) Turns the Random(Shuffle) feature on/off. 9. Repeat Turns the Repeat feature on/off. 10. Copy Copies the current file into My Music. 11. List Moves to the list screen. 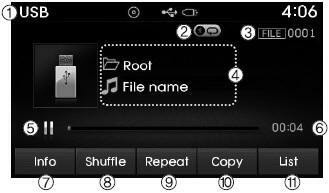 Once a USB is connected, the mode will automatically start and begin playing a USB file. Loading may require additional time if there are many files and folders within the USB and result in faulty list display or file searching. Normal operations will resume once loading is complete. The device may not support normal operation when using a USB memory type besides (Metal Cover Type) USB Memory. Press the keys to move to the previous or next file. Within this mode, you will have access to the Info, Random(Shuffle), Repeat, Copy and List features. Press the button to play files in random(Shuffle) order. Each time the button is pressed, the feature changes in order of Random(Shuffle) Folder➟Random (Shuffle) All➟Off. Random(Shuffle) Folder : Plays the files in the current folder in random( Shuffle) order. Random(Shuffle) All : Plays all files in random(Shuffle) order. Each time the button is pressed, the feature changes in order of Repeat➟ Repeat Folder ➟ Off. Repeat (Icon) : Repeats the current file. Repeat Folder (Icon) : Repeats all files within the current folder. If the iPod® is connected to the vehicle while it is playing, a high pitch sound could occur for approximately 1-2 seconds immediately after connecting. If possible, connect the iPod to the vehicle with the iPod® stopped/paused. During ACC ON state, connecting the iPod® through the iPod® cable will charge the iPod® through the car audio system. When connecting with the iPod® cable, make sure to fully insert the jack to prevent communication interference. When the EQ features of an external device, such as the iPod®, and the audio system are both active, EQ effects could overlap and cause sound deterioration and distortion. Whenever possible, turn off the EQ feature within the external device upon use by connecting with the audio system. Noise may occur when an iPod® or AUX device is connected. When such devices are not being used, disconnect the device for storage. When the iPod® or AUX device power is connected to the power jack, playing the external device may result in noise. In such cases, disconnect the power connection before use. Skipping or improper operation may occur depending on the characteristics of your iPod® /Phone® device. If your iPhone® is connected to both the Bluetooth® Wireless Technology and USB, the sound may not be properly played. In your iPhone®, select the Dock connector or Bluetooth® Wireless Technology to change the sound output (source). iPod mode cannot be operated when the iPod® cannot be recognized due to versions that do not support communication protocols. For fifth generation iPod® Nano devices, the iPod® may not be recognized when the battery level is low. Please charge the iPod® for use. 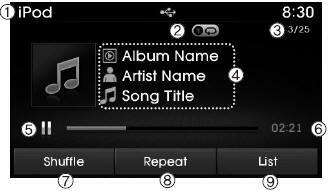 Search/play orders shown within the iPod® device may differ with the orders shown within the audio system. 2. Operation State From Repeat/Random(Shuffle), displays the currently operating function. 3. Song Index Displays the current song/total number of songs. 4. Song Info Displays information about the current song. 7. Random(Shuffle) Turns the Random(Shuffle) feature on/off. 8. Repeat Turns the Repeat feature on/off. 9. List Moves to the list screen. 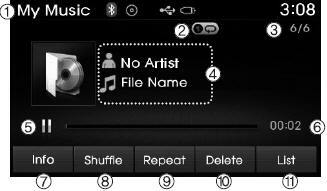 Within this mode, you will have access to the Random(Shuffle), Repeat and List features. Press the button to play songs in random(Shuffle) order. 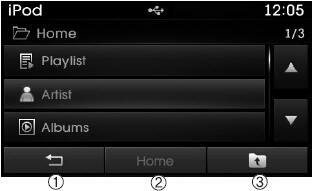 Each time the button is pressed, the feature changes in order of Random(Shuffle) Album➟Random (Shuffle) All➟Off. Random(Shuffle) Album : Shuffle Album plays album in Random(Shuffle) order. Random(Shuffle) All : Plays all songs in Random(Shuffle) order. An external device can be connected to play music. External audio players (Camcorders, car VCR, etc.) can be played through a dedicated cable. If an external device connector is connected with the AUX terminal, then AUX mode will automatically operate. Once the connector is disconnected, the previous mode will be restored. AUX mode can be used only when an external audio player (camcorder, car VCR, etc.) has been connected. The AUX volume can be controlled separately from other audio modes. Connecting a connector jack to the AUX terminal without an external device will convert the system to AUX mode, but only output noise. When an external device is not being used, also remove the connector jack. When the external device power is connected to the power jack, playing the external device may output noise. In such cases, disconnect the power connection before use. Fully insert the AUX cable to the AUX jack upon use. 3. File Index Displays the current file/total number of files. 10. Delete Deletes the current file.